Before he arrived in Tel Aviv on Monday many Israel supporters were angry at President Trump because of the disagreement with the advance team about the status of the Kotel and because the U.S. Embassy was not going to move to Jerusalem yet. However, by the time he left any objective supporter of Israel was still disappointed about the embassy remaining in Tel Aviv but ecstatic about the words and actions during the 28-hour stay of Trump in Israel. President Trump’s visit to Israel on Monday was more than an American leader visiting his country’s closest ally in the Middle East, it was a day of historic firsts, with an undercurrent of contrast between this President and his predecessor. On the tarmac of Ben Gurion airport, Israeli President Rivlin opened the welcoming ceremony with “Mr. President, we are happy to see that America is back in the area–America is back again.” It was not only meant as a welcoming to Trump, but a reminder that President Obama pivoted away from traditional U.S. allies such as Israel and the more moderate Sunni states, like Saudi Arabia, Jordan and Egypt, and toward the Shia terrorist state of Iran. 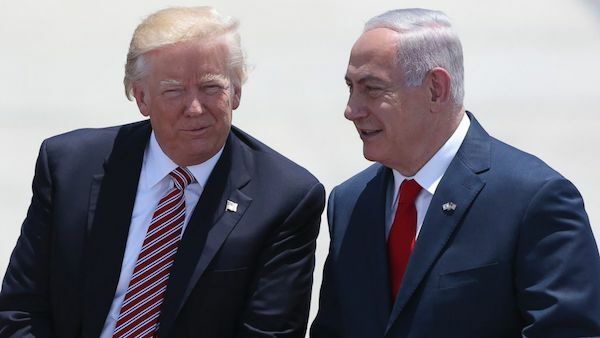 One could tell by the way Netanyahu kept switching between calling the American leader Mr. President and Donald in his speech, that the Israeli Prime Minister and the American President had a deep bond that started way before their present jobs. Bibi went on to praise Trump’s speech made in Saudi Arabia the day before, which signaled a 180-degree shift from Obama’s weak on terror/pro-Iran policies. Netanyahu also pointed out another first, he mentioned that Trump’s commute from Riyadh was the first publicly reported airplane trip directly from Saudi Arabia to Israel. This was something Obama couldn’t do as during his third trip overseas in June 2009 President Obama went to Saudi Arabia and Egypt, skipping Israel. After the airport ceremony and a meeting with Israeli President Rivlin, Trump was involved in another first. He visited the old city of Jerusalem, went to the Church of the Holy Sepulcher which recognized by Christians as the place where Jesus was Crucified. From there he walked to the Kotel, the Western retaining wall for the Temple Mount which is the holiest spot in all of Judaism. No other President had visited the Kotel while in office as the visit will be seen as a de facto acceptance of Israel’s control of the holy site. Trump did not allow Israeli politicians to come to the holy site with him because visiting the wall was already an indication of accepting Israeli control of the site, allowing Israeli leaders to accompany him would be rubbing salt in the wound. Donning a kippah, the president entered the Kotel plaza received a lesson about the holiness of the site, went up to the wall took a moment to reflect and as is the tradition of some he stuck a message to HaShem in the wall. After the historic visit to the Kotel, the traveling press corps complained that their female members were not allowed on the same side of the Kotel plaza as the president, the female reporters were kept on the other side of the mechitza (a divider between male and female worshippers at Orthodox Jewish synagogues, being a holy site for prayer, the Kotel is treated as a synagogue). They pointed out that a similar thing happened at the start of the President’s Middle East trip. Apparently two days earlier when Trump was in Saudi Arabia where women aren’t even allowed to drive., the President went to a concert by country singer Toby Keith that was strictly men-only. One might think rather than complain, the members of the press would have researched the different faiths and practices of each country on Trumps journey. Later in the day the President and FLOTUS found themselves in the Prime Minister’s residence. Before the two leaders met they did the traditional “photo-op/some words” etc. Bibi was effusive in praise of Trumps criticism of Iran, and the Iran deal and both leaders said the new American stance on Iran presented opportunities for peace. There was one more White House first. 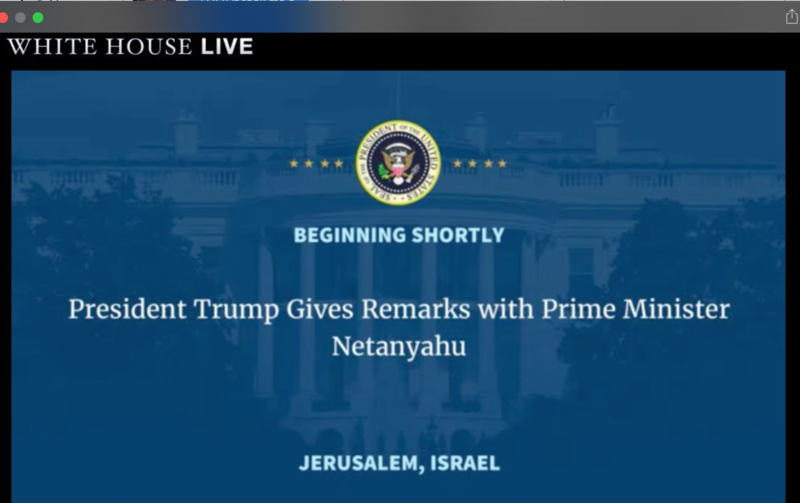 As the Whitehouse.gov website was about to steam the Monday’s post meeting comments of the President and Prime Minister they put up the screen below, notice the location of the meeting; Jerusalem, Israel. To my knowledge no president has ever recognized that Jerusalem was in Israel. Can President Trump negotiate a peace between Israel and the Palestinians, or as he called it “the ultimate deal?” After following Israeli/Palestinian negotiations for longer than can be recalled, I can strongly advise you never to put money on anyone being able to convince the Palestinians that peace is worthwhile, Arafat had a great deal and walked away, Olmert gave Abbas a similar deal and he said no. But this may be the time. President Trump is the master of the deal. And the closeness between Netanyahu and Trump may help. One of the reasons the Obama/Kerry/Indyk directed talks failed is Netanyahu didn’t trust them (and justifiably so). They started out with a very apparent negative attitude about the Jewish State. On the other hand, it seems as if Bibi trusts President Trump. This is what I’ve spent these last few days talking about during my trip overseas. Our society can have no tolerance for this continuation of bloodshed, we cannot stand a moment longer for the slaughter of innocent people. And in today’s attack, it was mostly innocent children. The terrorists and extremists, and those who give them aid and comfort, must be driven out from our society forever. This wicked ideology must be obliterated — and I mean completely obliterated — and innocent life must be protected. All innocent lives. Life must be protected. All civilized nations must join together to protect human life and the sacred right of our citizens to live in safety and in peace. Several days ago in Saudi Arabia, I met with the leaders of the Muslim world and Arab nations from all across the region. It was an epic gathering. It was a historic event. King Salman of Saudi Arabia could not have been kinder, and I will tell you, he’s a very wise, wise man. I called on these leaders and asked them to join in a partnership to drive terrorism from their midst once and for all. (…) I was gratified that President Abbas joined the summit and committed to taking firm but necessary steps to fight terrorism and confront its hateful ideology. And it’s so interesting that our meeting took place on this very horrible morning of death to innocent young people. Peace can never take root in an environment where violence is tolerated, funded and even rewarded. We must be resolute in condemning such acts in a single, unified voice. Peace is a choice we must make each day — and the United States is here to help make that dream possible for young Jewish, Christian and Muslim children all across the region. In so doing, we will all enjoy a safer and brighter future, and a safer and brighter world. Trump returned to Jerusalem to lay a wreath at Yad Vashem, the Israeli Holocaust museum, that was followed by an address back at the Israel Museum which may have been his best speech in the Holy Land. He began by recognizing the historic connection between Jerusalem, the Kotel, and the Jews. While Israel had heard from other administrations that they would always stand with Israel, for some reason this time seemed more believable. As the U.S. President and his party returned to the tarmac to board Air Force One and fly to the Vatican, it suddenly occurred to me the real truth about those words that before Tuesday always seemed hollow, the bond between America and Israel is unbreakable. Eight years of Obama’s anti-Israel policies may have stretched out the bond, or even weakened it–but it didn’t break the bond. A new president, whose commitment to Israel’s well-being and future seems legitimate not just lip-service in order to get campaign donations from Israel supporters but by a day of historic firsts, will actually strengthen that bond.